Players battle for the ball in Summer League. 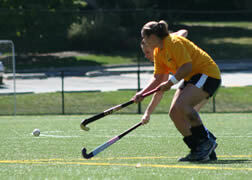 BFHA Summer League play is held on the two turf fields at the Roland Park Country School in Baltimore. ONLY water is allowed on the fields at all times. Please do not bring any colored liquids (gatorade) or food to the field at any time. Please also be mindful to pick up and dispose of all of your trash. Thank you for your cooperation. Follow the directions below or visit Roland Park Country School's web site for more information. Take 695 to 83 South. Use the Northern Parkway East exit. Follow Northern Parkway to the second light and turn right onto Roland Avenue. The School is about 1/3 of a mile from Northern Parkway on the right. Take 83 North to Northern Parkway East exit. Follow Northern Parkway to the second light and turn right onto Roland Avenue. The School is about 1/3 of a mile from Northern Parkway on the right.